I've been reading through the forums here trying to get info on whether installing a second meter or changing to the time-of-day plan with So Cal Edison would be better. I called and tried to get their EV Power Plan but the rep I spoke with was not very helpful. I have solar on my house, so that is why I am considering TOD. 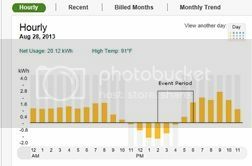 I posted my SCE usage and solar production for a typical day without EV charging. What does everyone think? Drop $1400+ for the second meter or just switch to the Home and EV plan? Thanks!! Re: TOD or Second Meter? I'd suggest sticking with a single meter. That is the exact setup that I've had for over 2 years of EV charging, and it works like magic. I haven't had an electric bill in the entire time period, spanning 29 months and 26,000 miles of LEAF driving. Current SCE rates with the TOU-D-TEV single meter plan are about 9.5 cents per kWh for Super Off Peak overnight charging between midnight and 0600 in both Tiers. You do get higher Peak rates, but if you are net negative due to solar generation during Peak hours (M-F 10 am to 6 pm, IIRC), those higher rates contribute an equal retail credit in that amount, which offsets your power usage during non-solar hours. Combined with annual Net Metering, I've banked enough solar generation dollar credits during the summer to offset all of my usage for the rest of the year, even though my solar system doesn't fully offset all of my household usage. It's a bonanza, I tell you! I do pay a minimal monthly service charge of les than $2. EDIT: By the way, it's no surprise to me that you are finding little help at SCE. Three years ago when I was looking into this, almost nobody at SCE seemed to have a good enough overview of the combination of billing rates, metering choices, solar with NEM and EV charging. It's a tall order for them, but I finally got good information about how their billing structure works from a young analyst in their Plug In Vehicle (PEV) group. I built some spreadsheets based on that information, and they have helped me immensely. My solar system is 5.12 kW DC, consisting of 24 panels of 215 W each facing south in Orange County. Caveat: If you use a ton of power during weekday Peak hours, such as heavy air conditioning, pool heating, or a large server farm, etc, this will eat into those lucrative credits that you can earn with your solar during Peak hours. See my blog, linked below in my signature, for way too much detail on my monthly bills, solar performance and car charging energy usage.